I found the cutest award and it fits perfectly for me to give out! It's the: "Mender of the Broken Hearts Award"
1. Mrs.GiJoe - This woman is amazing! She's a military wife, she has an amazing blog, she's funny and goes above and beyond in the advice department! 2. NoGuamNoGlory- Over at OurGuamazing Adventure. This woman is hilarious! She runs, she bikes, she travels and is going through a deployment. Yet she does nothing but smile and look amazing in every photo (so jealous of the photogenic-ness)! I love reading her blog, she always have the funniest stories and great pictures to back them up. 3. SweetTea1 - Over at A Sweetheart & A Soldier. Countless, countless emails and instant messages later....we've kept each other sane. This girl is awesome and can handle every thing thrown at her in an amazing fashion. 4. ShoshanahG - Over at From L.A. to L.A. - This lady gives out some of the greatest food tips and recipes ever! She has great taste in movies as well. She also gives out great relationship advice and seems to be living an amazing life! She thrives! 5. Karie - Over at Being the Wife of a Wounded Marine- This woman has been through the worst situations imaginable. She knows what it's like to have been faced with your worst fears. She gives great advice, listens and even has a sense of humor through all of it. Check out her blog! She's awesome! 6. Jon & Steph - Over at Adventures of Jon and Steph.- They always seem to be having a great time! They travel NON stop and currently live overseas. She gives out great words of wisdom and always seems to see the positive side to any situation. Check out her blog, she also never fails to have amazing photos and stories of her travels. Thank you to every single one of my blogger buddies! You help me sooooo much! Daaaamn! It's one thing for the guy to make a decision and be like "I don't want this" but it seems like the dude changes his mind as much as he changes his underwear!! 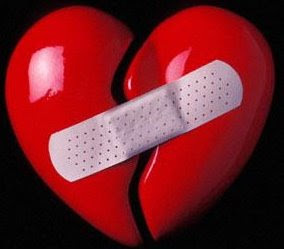 It's one thing to have a broken heart...it's another if you can't move on b/c of being jerked around. One of my biggest pet peeves is being jerked around! I wouldn't blame you if you just decided not to go see him. Whatever you decide to do, you must know you shouldn't have to put up with that! Hang in there, girl! Hmmmm....you make the decisions that are the best for you, don't let him make decisions for you! It's seems as if he's already made up his mind and I'm sorry that three days before you leave to see him he drops this bomb on you. You seem to have given him everything you've got and for you to spend an ounce more is far more than it seems he deserves. OIY! What a jerk! I am so sorry to hear that. I have been keeping up with that situation but I really been able to come up with something constructive to say. All the "advice" I can come up with is just down right mean (towards him!) but I think it wouldn't go over well all the same. Any way... listen to your heart I think based on what you have said in the passed, that you already know what you want and this guy doesn't seem to be giving it to you! Don't settle honey! =) BE HAPPY! My first award, Wow! Thanks so much! I'm just glad I could help out the girl who really did keep me sane all those weeks. You're a life-saver! I'm sorry Matt's up to his old trick. He sure is gonna have some answering to do come Wednesday. oh no. I am so sorry to hear he is putting you thru this BS. And what the heck dude..... you don't want the relationship but will be oh so generous to "hang out" for a few days. Really? That's very selfish of him. I'm so tired of hearing guys pulling this stuff with good women. They don't want the relationship but still expect the woman to settle for less and give him the benefits without the commitment. Whether you cut him off post haste or decide to go and have a convo with him, my heart goes out to you and I wish you the best. I personally think you deserve better treatment. I told my hubby the latest update and he said he wouldn't go see him. It's ridiculous. Something is definatly wrong with him and he's leaning toward the unstable. You know, you should just throw it back and him and only agree to see him one day and then leave! I can imagine you are feeling very nervous! You never know what will happen but I really hope that you at the very least can get some closure from this trip. Oh wow, how insensitive of him. I would NOT make time for him, maybe see him once if it fits in YOUR schedule. Try not to let it get you down, you deserve better! Wow...he's a jerk. He doesn't even have the decency to tell you to your face? And he's going to see you in 3 days? I know it's easier said than done, but you should just tell him to find someone else to hang out with during R&R. He doesn't deserve you. I am so sorry you are going through this hun! We've all been through guys like this (complete jerks) and it's no fun. I know it's hard when you have your heart in it though. You derserve someone that is going to be on pins and needles, jumping out of his skin, so excited he can barely stand it to come see you. Not one that can't make up his mind if he even does or not. Whatever his reasoning it can't be good. You're the one that has to make the decision if you want to go see him at all, but if you do, please make sure he knows that you will not put up with this! It's not fair for you to be waiting around on someone that never plans to commit to you! Again, I'm sorry.. but I know everything will work out for this best for you! Hunny, douching is bad for you. Oh no! I hope everything works out ok. Hang in there! I know I'm a little late, but thanks so much for the award! While I do enjoy my life, I feel awfully honored that you think I'm living an amazing one. Thanks!